Buildings or complexes of buildings in which each unit is individually owned and ownership of common areas and facilities is shared. Photograph of a design concept drawing for the interior lobby of the Market Galleria lofts. Photograph of a condo development sales centre, not of the finished building. This two-building townhouse complex was completed in 1976. The design received a Canadian Architect Award in 1980, and Canadian Housing Design Council Award in 1983. 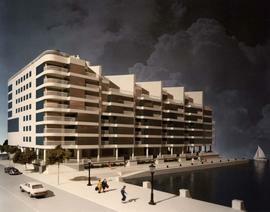 Architectural illustration of a high rise apartment complex. Photographs of exterior of condominium apartments located at 1855 Nelson street in Vancouver, British Columbia. 2 colour photographs of the exterior of a community in Shoal Harbour in Sidney, British Columbia. 1 photograph of Quayside Terrace in New Westminster, British Columbia. The building was awarded 1986 New Westminster Building of the Year. Exterior views of the mid-rise condominium complex in the St. Lawrence Market neighbourhood, with central courtyard and street-level shopping arcade. One interior view of shopping concourse and one aerial view of area prior to development.